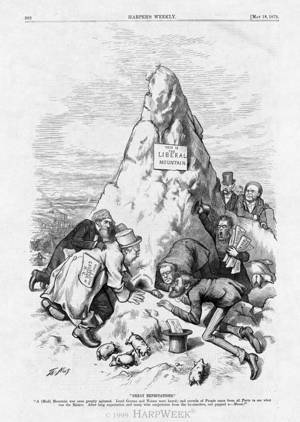 Great Expectations,” published May 8 (in the issue dated May 18), was Nast’s first cartoon since the Liberal Republican National Convention concluded on May 2. He had assumed that diplomat Charles Francis Adams would be nominated for president, and had nearly completed this drawing when he learned of the surprise selection of Horace Greeley. Nast altered the picture, probably on the woodblock after it had been engraved, by changing the tiny head on the mouse from Adams’s face to Greeley’s and by inscribing vice-presidential nominee Gratz Brown’s name on the mouse’s tail. (This is why Greeley appears twice, watching his own figure as a mouse).